Betsy Ezell will present and celebrate the release of her debut full length album, Voices, on Friday, January 25 at North Street Cabaret. The Betsy Ezell Quintet will perform the original compositions and arrangements from the album, well known standards, personal favorites written by women jazz artists and more. 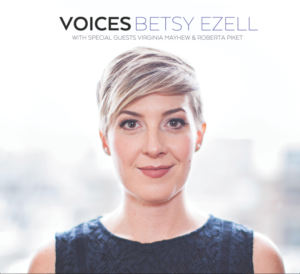 Many of the original songs from Voices were composed in 2018 as part of a writing and recording project called Feminine Blue, supported in part by an Artistic Development Grant from the Greater Madison Jazz Consortium. The project explored women’s perspectives and unique voice in jazz, as well as broader cultural themes like the #metoo movement. The music was composed collaboratively, with the writing led by Ezell and edits, additions, input and support by Lang and Grant, which was an intentional and more feminine way of creating. New York-based, prolific jazz artists Roberta Piket (piano/organ) and Virginia Mayhew (sax) guest performed on two tracks on the album. Piket was named Rising Star for Organ in Downbeat Magazine’s 2018 International Critics Poll. Ezell grew to love jazz in college while studying under Gabriel Espinosa at Central College in Iowa. She began performing in Madison only four years ago.